After 3 months of hard work and an enormous effort from the crew to get the North Course into tournament condition we now find ourselves with two major tasks to take care of for the rest of the summer. Keep everything alive and keep it cut. With all of the major projects having been completed we are now faced with the equally difficult job of battling the heat out on the course. At the beginning of the year along with cooler temperatures the crews focus would be on bigger projects, such as course construction like the project on 4 North. Also we added many thousands of square feet of sod to the courses. However, now that the temperatures are peaking our focus must shift. Now that we have been exposed to prolonged stretches of high temperatures the soil temperature are starting to stay at temperatures high enough to restrict root growth. This happens when average soil temperatures remain above 77 degrees farenheit. When this happens the roots of the turf no longer dive deep into the soil to find moisture like they previously did. Instead, the root system shortens itself and looks upward for moisture. To account for this, much more attention is necessary to ensure that the turf doesn’t burn up. We have had some serious drought conditions so far this year and while the recent rains have been helpful it still isn’t enough to erase the long-term moisture deficit that the turf has been in all summer long. The only way to ensure healthy turf is by putting in long days monitoring moisture levels and keeping the grass alive. 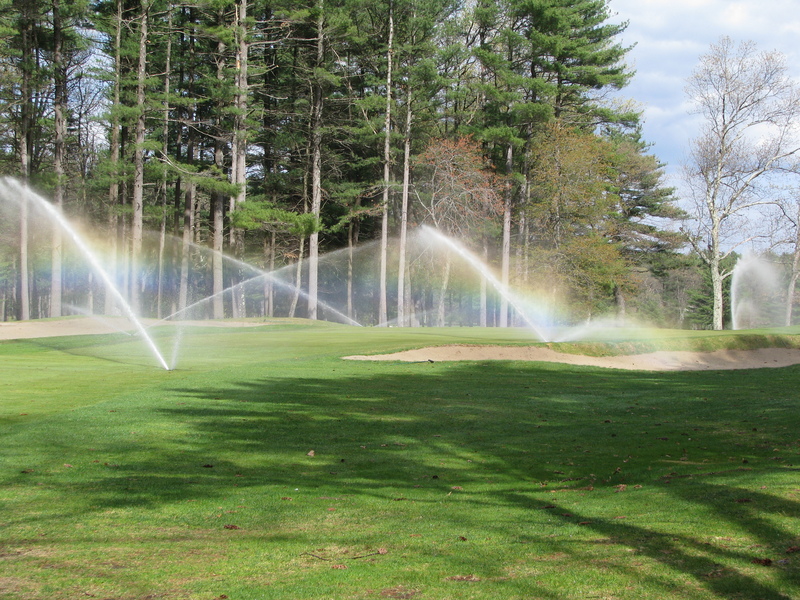 Although heat plays a significant role in turf health, it also takes a large toll on the crew. Earlier in the year we may have been able to get away with pushing the crew for 10-12 hours days doing big projects but now with it getting hotter earlier in the day and temperatures routinely topping out in the 90’s such is not the case. The focus of the crew has switched from focusing on projects to focusing on maintaining both courses. Keeping the courses mowed, the bunkers raked, and everything in between trimmed and clean has replaced sod jobs, construction projects, and group cleanup jobs. having this focus ensures that both courses have a clean, aesthetic look and also that the crew isn’t getting worn out in the summer heat. While in the past months the crew was busy preparing for the 3-day Junior PGA event we have now shifted our focus accordingly for the rest of the summer. Before we had a long list of smaller jobs that needed to get done but now we have one major task to focus on for the rest of the summer. Keep it alive, and keep it looking good.